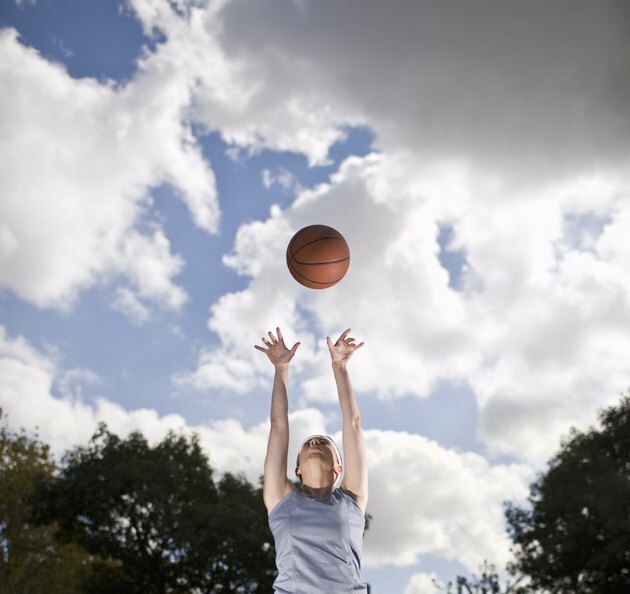 To excel in basketball you need agility and focus, but you also need a great deal of strength. Basketball works most of the muscles in the body, but when it comes to taking a shot, the arm muscles are most heavily relied upon. To help improve your basketball shooting range, it's essential that you focus on strengthening all of the major muscle groups in your arms. The arms are made up of several muscle groups. The deltoid is a triangular-shaped muscle of the shoulder that spans part way down the upper arm. The biceps sit at the front of the upper arm while the triceps are at back. The lower arms or forearms are made up of multiple muscles, including the brachioradialis muscle, flexor carpi radialis muscle and the extensor carpi radialis brevis muscle. To target the deltoid muscles in your shoulders, include the dumbbell Arnold press as part of your total arm routine. Start in a seated position on the end of a flat bench, your legs shoulder-width apart, feet flat on the floor. Grasp a dumbbell in each hand, your arms bent with your palms facing in so the dumbbells are against your chest. In a slow, controlled movement, bring your arms out to the sides and up over your head, until they are fully extended above you. Return to your starting position. The barbell curl is an effective exercise for targeting the biceps, which are essential for helping you extend your shooting range. Stand straight with your feet shoulder-width apart, arms extended down at your sides. Hold a barbell with your hands in an underhanded grip, so the barbell rests against the front of your thighs. Keeping your arms close to your sides during the movement, flex your arms to bring the barbell up to your chest. Lower it back down to your starting position. The dumbbell triceps kickback exercise is an isolated exercise that targets the triceps muscles. Start in a standing position with one foot slightly farther than shoulder-width apart from the other. Lean over slightly while keeping your back straight, your right hand resting on your right thigh and your left arm flexed at your side. While grasping a dumbbell in your left hand, slowly extend your arm out until it is completely straight and then bring it back to its starting position. Repeat and then switch arms. Build strength in your forearms with the barbell reverse curl. Stand straight up with your feet shoulder-width apart, your arms down at your sides and your hands grasped around a barbell in an overhanded grip. Keep your arms close to your sides and bring your arms up until the barbell is resting on top of your shoulders. Slowly lower the barbell back down to your original position. Strength-training exercises are essential for building muscle and giving you the power to throw the ball farther, but stretching is also important. Regular stretching helps promote flexibility and balance, expanding your potential in the game and helping prevent injury. Even spending just five- to 10-minutes before a game performing a few basic stretches will make a huge difference. Focus on stretches for the arms and hip flexor muscles so you can jump and throw with more power.